The Devine Write: What Are You Doing To Help? 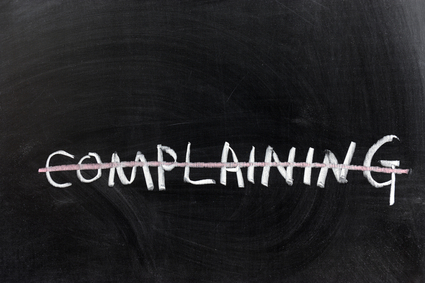 Pretty much everyone enjoys whining and complaining. From the time of our childhood, and well into our adult lives, we get some form of pleasure from verbalizing negative things. I have to exert mental energy to not complain. But I intend this post to be more than just another whining session about whining. I'm not going to whine. I want to challenge you (and me). The next time you feel the urge to complain about something or talk about your negative perspective, ask yourself one giant question before you proceed. "Nothing." Then keep your mouth shut. "I'm making the problem worse." Keep your mouth shut. "I'm trying as best as I know how to help with this issue." Okay, you can talk. But I have noticed something interesting. When I involve myself in something to the point of personal sacrifice, I am not as likely to whine and complain about it. If I am striving to make my workplace environment happy and productive, I am less likely to complain about my workplace environment. Take that last sentence and replace "workplace environment" with almost anything--softball team, church, family, marriage, friendship, business partnership. The principle still works. When you become personally involved in improving something, you cease to complain and begin to problem solve. As a concluding example, I have noticed that many people that complain about Facebook are not on Facebook. They say they're not on Facebook because it's so horrible. But really they're not on there because they have only a snack-sized amount of self-control. They constantly fight and bicker because they can't tolerate all those people out there that don't think exactly like them. They are also painfully disgusted by the fact that everyone is not as perfect as they are. Ugh. They can't place nice, so they sit on the sidelines and complain about the game. It's very reminiscent of 5th grade. If you're going to complain about Facebook, ask yourself if you're doing anything to make Facebook better. Are you encouraging people on Facebook? Are you helping people on Facebook? Are you sharing useful information on Facebook? The world (including all social media) becomes better or worse when people make it better or worse. So go do something good. "Drink coffee. Do good." is a registered trademark of Land of a Thousand Hills Coffee Company.